More than 50 years after the start of containerisation, Cargotec has envisaged the way the port of the future might look against a possible backdrop of game-change technology and innovation. The project, dubbed 'Port 2060', was devised to spark discussion within the terminal operations sector and to try and anticipate the challenges and solutions that will be relevant to containerisation as it approaches its centenary. Cargotec employees were invited to engage in some 'totally out-of-the-box thinking', so that the company could use TOC Europe 2011 in Antwerp to launch a possible vision of the future. 'Port 2060' aims to develop the process and ideas that will underpin containerisation in around 50 years time. According to Ismo Matinlauri, Cargotec's Senior Vice President, Port Cranes: "With the cargo handling market on the upswing we felt it was time for us to consider the future for a while and do some long term thinking. We asked: 'Where are we heading, what will be changed, and what could remain as it is?' This exercise is part of our ongoing drive to enhance our customers' operational performance, as we believe now is the time to start preparing for the future together." By around 2060, the world will be celebrating the centenary of containerisation. 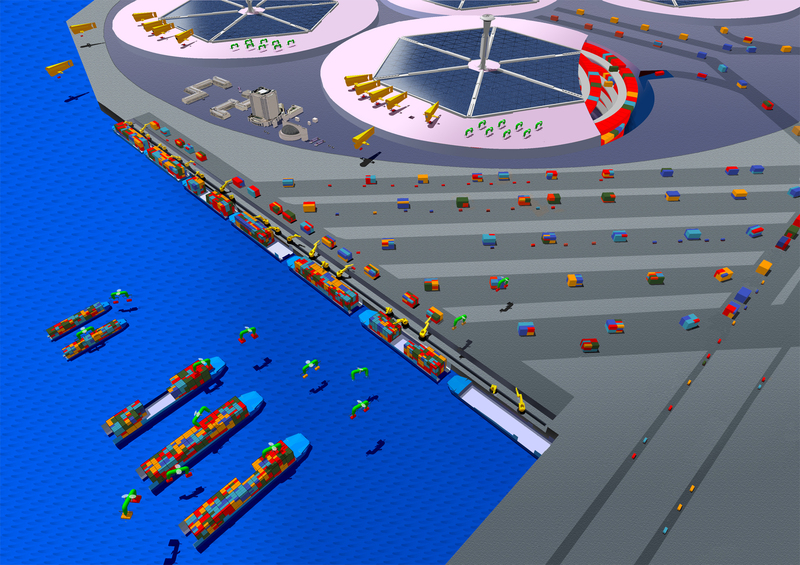 Cargotec's Port 2060 vision suggests that over the next few decades cargo handling technology will keep evolving and take different forms. And yet containers will keep moving cargo around the world. 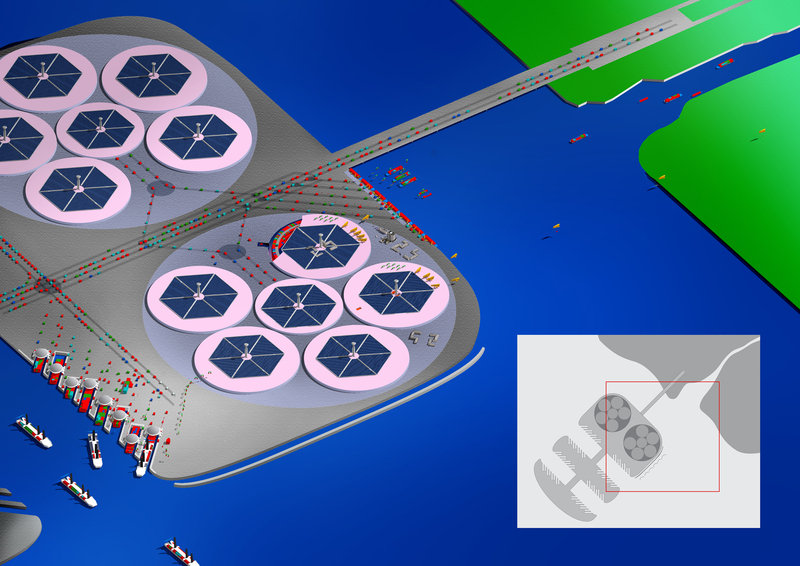 By 2060, the company says, mega ports will be located offshore on artificial islands where layouts can be optimised. 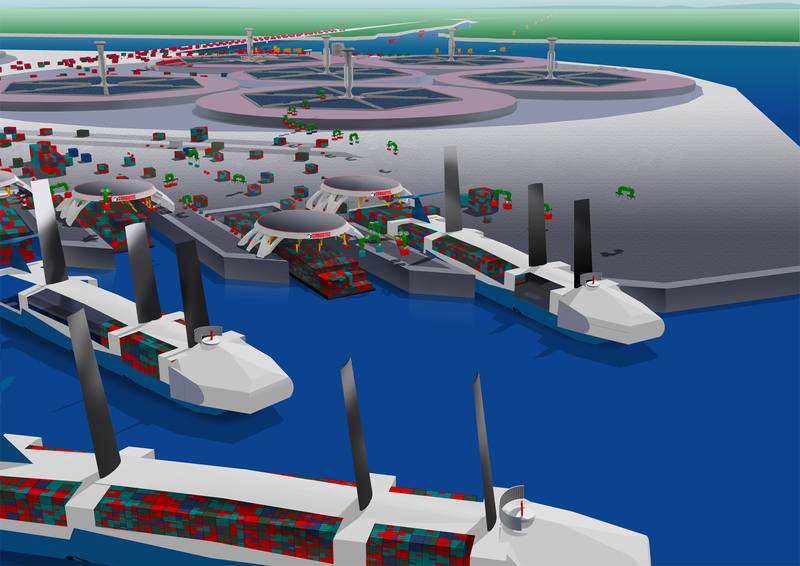 These ports will be supported by floating feeder/river terminals that can be moved around in line with changing demands. The container itself will remain in use, based on the same compact, standardised format. But different materials might be used, while containers could be foldable and may have inbuilt intelligence to communicate destination, contents and journey details. One of the most interesting ideas generated by the Port 2060 project is that fully automatic lashing systems could form different container 'packages' with up to 64 containers in a single moveable unit. Container crane lift capacities could increase from around 40-100 tonnes today to 1,000-2,000 tonnes, so that they could handle such container packages in a single lift. Container storage could take place in terminals located in underground silos, as land will be at a premium by 2060. An automated tracking system will locate and store containers as required in these terminals, which will be powered sustainably by solar panels on top of the silos. While some current containership designs will still be in operation, the majority of container vessels of the future will be fully automated, or with very small crew, with numerous energy saving features, including solar technology. They will also be designed so that a container block can be separated from the vessels if needed, allowing them to then pick up another cargo block and sail on. One of the most startling concepts could be 'flying spreaders', using nano-fibre technology that by then will have replaced steel wiring. Feeder vessels will be loaded in part by these flying spreaders, facilitating last minute loading changes for instance. Within the Port 2060 environment, automation is virtually the sole mode of operation. Artificial Intelligence (AI), widely used in daily life in 2060, will monitor port processes, thereby optimising performance. Cargo handling systems will use alternative energy sources or electric drives, and wheels will have been replaced by air cushion or magnetic levitation technologies. Handling equipment will have its own 'consciousness', allowing it to monitor wear and tear, and will be able to order its own maintenance and repairs remotely. Landside handling equipment will be made up of universal modules that are fully interchangeable between different types of equipment, and will be tailored using special software solutions. "Port 2060 is about releasing our creativity," said Matinlauri. "The future as described might be much more exotic, or less so, but we need to be prepared for change whatever direction it takes. It might seem that 2060 is a long way away, but many of those who will be celebrating the centenary of containerisation around 2060 are already alive today." Cargotec invites everyone to join the discussion about ports of the future. Visit www.cargotec.com/port2060 to view a movie and learn more on the topic. Photo 1: Cargotec has envisaged the way the port of the future might look in 2060, around the centenary of containerisation, where mega ports are artificial islands and containers are organised in underground silos. Photo 2: Fifty years into the future, feeder vessels could be loaded partially with flying spreaders, and thus last minute loading changes can be made or late arrivals can be loaded onboard the next leg of transportation. Photo 3: Cargotec's 'Port 2060' concept imagines automated lashing systems that can alone form 'packages' consisting of up to 64 containers. These container 'blocks' can be separated from ships and then picked up by vessels sailing onward.